Of course, this is one of the most realistic works that have come from the hands of the master. The work attracts by the fact that in this case the master concentrated the viewer’s attention on the inner component of the whole image. The first thing that catches your eye is the fleshy lips and glossy cheeks of the person being portrayed, which directly indicates that in front of the viewer is a typical landowner. Moreover, his smile, says a certain amount of cruelty and arrogance. Despite this, in his eyes one can see the presence of a mind that is not afraid of any ridicule or even some contempt. A typical image of a nobleman, of that time, appears before the viewer. A special place is occupied by a beautiful pictorial technique, which the artist skillfully coped with. The volume of the face, texture, image and other details are very skillfully made by the free brush of the master. The most confident strokes, qualitatively convey the twinkling of gold and red tones. With all this, the colors are much thinner and more refined. Especially worth noting, as the artist masterfully executed the web of silk lace. 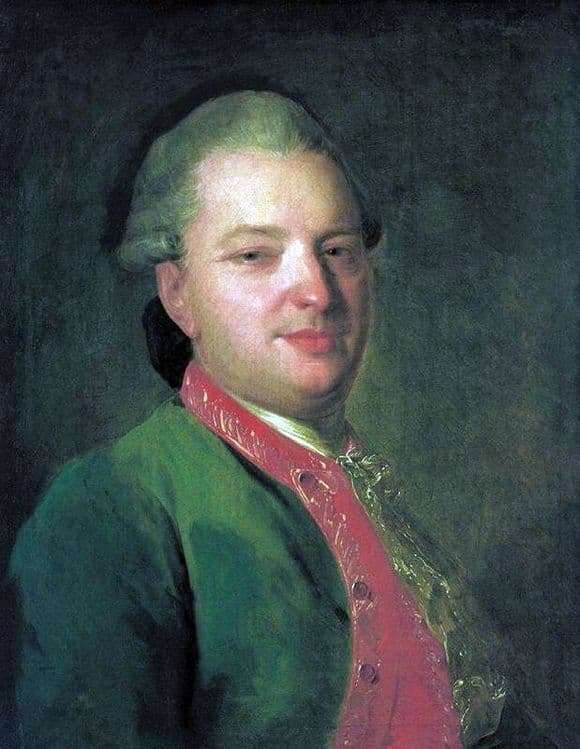 It is obvious that the artist in this portrait tried to maximally compare the marsh-green color with the red. These two colors are perfectly softened by each other by the artist, and the white lace collar only complements their shimmer. Rokotov uses in this work a large number of various shades, so that the colors get a shining depth. It can be seen how barely noticeable, even the artistic brushstroke of the master, takes on a very important realistic meaning, thereby expressing a certain awe in life. Perfectly conveyed emotional impressions. It is these portraits that the master says that the first period of his search has been successfully completed and the peaks of his goals and tasks in portraitism have been reached.